Equity investments performed the best of all asset classes. They accounted for 34 (31) per cent of Varma's investment assets, yielding a return of 14.5 (-13.0) per cent. Equity investments consisted of listed equities (25 per cent), private equity (7 per cent) and unlisted equities (2 per cent). The return trend of listed equities was very good, as listed companies paid high dividends and with share prices rising during the year. The return on listed equities amounted to 14.9 (-18.9) per cent. Share prices increased significantly on all the main markets. Finnish equities yielded the best return, at 21.3 (-22.2) per cent. The performance of Sampo Corporation, Varma's largest holding, was especially strong, with an annual return of 35 per cent. Share prices fluctuated wildly during the year. By summer, prices in Finland and Europe fell to below the level of the early part of the year, but experienced a sharp upswing towards the end of the year, owing to the drastic stimulus measures implemented by the European and U.S. central banks. The share price trend was similar in the U.S., although the decline in the first half of the year was more modest. 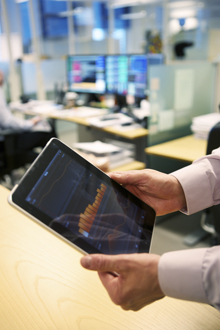 From an economic perspective, the outlook for the equity markets is challenging. The low, near zero-level interest rates do improve the return potential on equities. Dividend income from solvent listed companies is attractive, considering the interest-rate level. 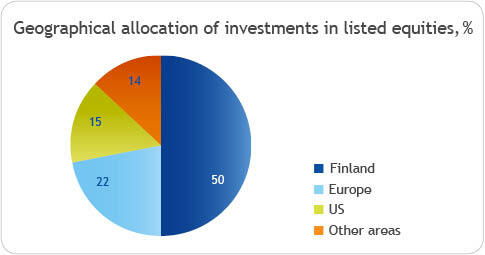 Finnish equities accounted for 50 per cent of Varma's listed equities at the end of the year. 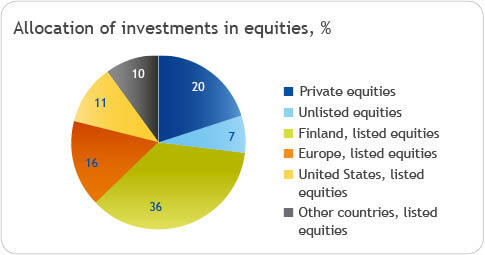 European equities accounted for 22 per cent, U.S. equities for 15 per cent and other areas for 13 per cent of all equities. To counterbalance the high share of domestic equities, Varma has broadly diversified its portfolio outside of Finland, not only in international equities, but also in private equity investments, hedge funds and corporate bonds. Private equity investments and unlisted equities also generated good returns. Private equity investments yielded a return of 13.0 (9.6) and unlisted equities 15.5 (20.7) per cent. Close to half of Varma’s private equity investments are invested in the U.S., and the rest mainly in Europe and the Nordic countries. The value of these investments developed strongly in all areas. The rise in share prices and the positive financial performance of private equity funds’ portfolio companies translated into good returns. Activity in the U.S. financial and acquisition markets was brisk, resulting in major capital distributions. Unlisted equities include Varma’s holdings in the housing real estate companies SATO Corporation and VVO Group, which developed steadily due to dividends distributed and an increase in value. Unlisted equities also include private equity co-investments, which yielded a good return. Examples of these are Ziggo N.V., which was listed in the Euronext Amsterdam in the Netherlands, and United Coffee, which was sold. Private equity and unlisted equities are a long-term asset class, and their long-term return has been very good. Equity investments yielded the best returns despite the challenging environment in the stock markets. Read more about our equity investments on our website.